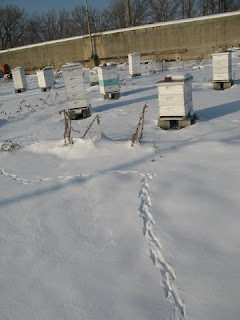 It's Winter here in Chicago and this is the time of year when beekeepers catch up with everything they didn't have time to do from April until October. Hence my ability to sit down and write this first post. Not that I get to do much beekeeping myself. Besides my own job I am the member of our Co-op that takes care of our day to day business. I should tell you about our little Honey Co-op. We started out in 2004 as an idea in the minds of three of my (now) friends. That first year we partnered with a local nonprofit to offer job training in beekeeping, selling at farmers markets and the various skills that go along with that. The trainees were people who had spent time in jail and had no prospects for employment ahead of them. It was an eventful year and we did very well for a brand new business but I'm sorry to say that after a couple of years things didn't work out with the nonprofit. We decided to go ahead on our own in 2006 with 2 of the original trainees who became our regular beekeeping staff. We registered as an agricultural co-op and sold memberships to raise capital to purchase some more hives. Since we don't have the staff or funds to pay trainees ourselves we partnered with another nonprofit to teach beekeeping to their urban farming trainees. I should mention how lucky we are to have found a large vacant space on the West side of Chicago to have our apiary. It is a city block long and backs up to an abandoned rail line. In addition to beehives we have made a large community garden there for our neighbors and friends to grow food. Through the kindness of the owner, we rent this land for $1.00 per month until it gets sold. In the coming weeks, I'll tell you more about our co-op, our products and I'm looking forward to writing at length about beeswax and honey.